Anabolic steroids have been utilized in an effort to accelerate the acquisition of muscular force and body weight. hypertrophy and muscular force increases in normal healthy men. During the past decade, a growing controversy has developed regarding the use of anabolic steroids by normal young men for the purpose of promoting body weight gains and muscular force. Johnson and O'Shea 5 found that strength, body weight, oxygen uptake and blood nitrogen retention were significantly increased when healthy subjects were administered an anabolic steroid. Johnson et al.' found that the strength of the treated healthy subjects increased significantly and their mean weight gain was significant. However, Casner et al.' did not observe significant differences among groups on muscular force increase and body composition. An investigation by the author 2. demonstrated significant effect by an anabolic steroid (methandrostenolone) upon reflex components. 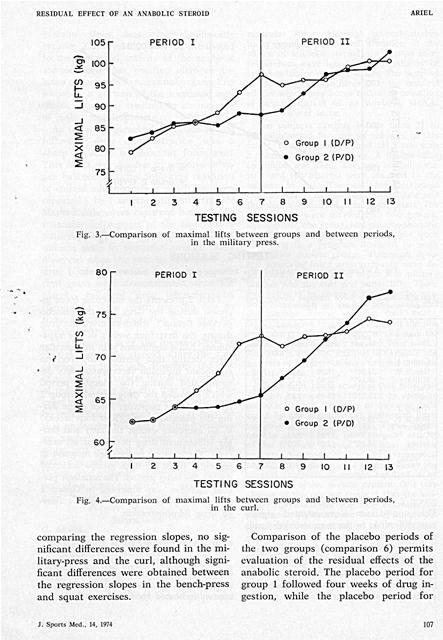 In addition, Ariel and Saville ` observed that significantly greater gains were made during a placebo period demonstrating the psychological potency of the drug. Although several studies have specifically directed attention at the effects of anabolic steroids on healthy men, researchers have ignored the possibility of latent behavior of these drugs. This study was designed to investigate the residual effects which may occur following cessation of administration of an anabolic steroid upon muscular force. The population consisted of male weightlifters registered at the University of Massachusetts during the 1971-72 school year. A sample of ten subjects ranging in age from 21 to 25, volunteered to serve as subjects in this study. Their height averaged 181.5 cm. with a mean weight of 90.40 kg. A double-blind technique was used with determination of the placebo and treatment groups accomplished by random selection according to strict double-blind procedures. The oral anabolic steroid and the placebo were assigned to the subjects by code by the University Health Service and the investigator was not informed which subject received the steroid until after the eight-week testing period. The oral anabolic steroid (methandrostenolone) consisted of 15 mg. Methandrostenolone and the placebo consisted of calcium lactate. The University Pharmaceutical Laboratory prepared the tablets and both the anabolic steroid and the placebo were indistinguishable in their appearance. i bolic) received the placebo during the first four weeks and the anabolic steroid during the last four weeks. major muscle groups of the body utilizing progressive over-load principle. Maximum dynamic contractile force measurement were determined by 1-RM in the bench and military presses and the curl and squat lifts. Techniques used in performing the four lifts were those prescribed by the Amateur Athletic Union rules for weightlifting competition. As strength gains are a function of training over a period of time, the relationship between both the gains in strength and the effect of time suggested a comparison of the regression lines to compare the strength gain rate in the drug and placebo periods. Jn addition, analysis of variance and analysis of covariance were utilized in assessing the data. 1. Period I (drug) and Period II (placebo) for group 1. 2. Period I (placebo) and Period II (drug) for group 2. 3. Group 1 (drug) and Group 2 (placebo) in Period I. 4. Group I (placebo) and Group 2 (drug) in Period II. 5. The drug period for Group. 1 (Period I) and the drug period for Group 2 (Period II). 6. The placebo period for Group 1 (Period II) and the placebo period for Group 2 (Period I). tained in the different statistical analyses for the experimental tests. When comparing the drug period and the placebo period for group 1, significant gains in muscular force were observed in both periods in the bench press, military press and curl exercises. In the squat exercise, significant gains were obtained only in the drug period. The regression slopes were significantly different for all the exercises. Comparison between the two periods for group 2 (comparison 2), revealed significant differences for all experimental tests. ed in the bench-press, military-press or the squat exercises. However, significant differences were obtained when comparing the regression slopes of the two groups, indicating different rates of progress. Comparison of the two groups in the second period (comparison 4), yielded significant differences in the benchpress and squat exercises but no significant differences in the military-press and curl. However, as in comparison 3, all the regression slopes yielded significant differences between the groups. TABLE 1.-F-ratios of the six comparisons. *F-ratio significant at the .05 level of confidence. **F-ratio significant at the .01 level of confidence. 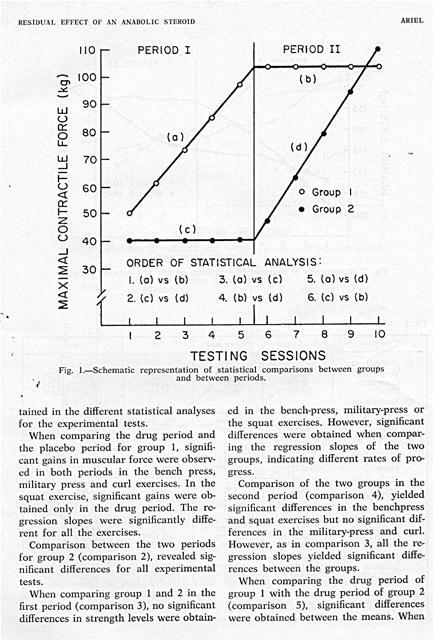 of maximal lifts between groups and between periods, in the military press. of maximal lifts between groups and between periods, in the curl. comparing the regression slopes, no significant differences were found in the military-press and the curl, although significant differences were obtained between the regression slopes in the bench-press and squat exercises. maximal lifts between groups and between periods, in the squat. TABLE 2-Muscular force increase during drug and placebo periods (in Kg.). :F-ratio siUnificant at the .05 level of confidence. **F-ratio significant at the .01 level of confidence. group 2 prcceeded receiving the steroid. This comparison demonstrated significant difference in the man strength levels in all the experimental tests. However, the regression slopes yielded no significant differences in the bench-press, military-press, or the curl exercises. The regression slopes in the squat exercise were statistically significant. Table 2 presents the muscular force increase during the drug and the placebo periods. 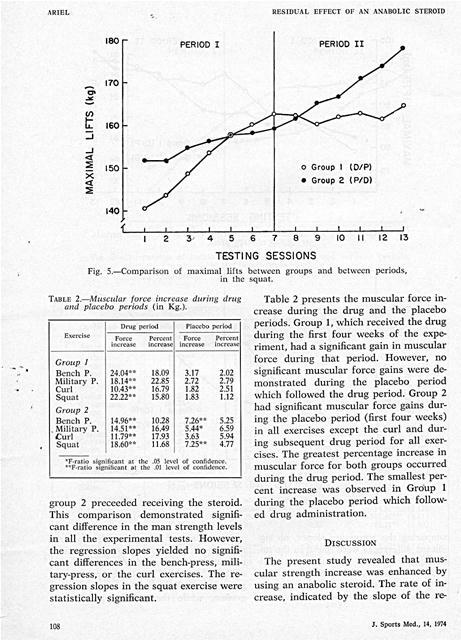 Group 1, which received the drug during the first four weeks of the experiment, had a significant gain in muscular force during that period. However, no significant muscular force gains were demonstrated during the placebo period which followed the drug period. Group 2 had significant muscular force gains during the placebo period (first four weeks) in all exercises except the curl and during subsequent drug period for all exercises. The greatest percentage increase in muscular force for both groups occurred during the drug period. The smallest percent increase was observed in Group 1 during the placebo period which followed drug administration. gression lines, was also significantly greater. These results may be attributed to the biological activity of the anabolic steroid such that positive nitrogen balance occurred in extragenital organs. Presumably, a portion of the increased synthesis of protein resulted in an increase of active muscle protein. An obvious characteristic of the period following drug administration was a sharp decrease in muscular force gain. This effect may be due to negative nitrogen balance occurred following cessation of steroid administration which has been reported by several investigators."' Marked differences occurred between the muscular force gains of the two groups with respect to the placebo period. Significant gains in muscular strength were observed when the placebo preceeded the drug (Group 2), while small, non-significant gains were demonstrated when the placebo followed drug administration (Group 1). This result may be due to some latent drug behavior or a drug-stimulated effect. One conclusion of the present study is that the anabolic steroid alters the rate of tinuscular force gain. However, the lack of significant progress following cessation of the drug may indicate that rate of progress and net muscular strength gain may be independent of each other. It may be that prolonged muscular training without an anabolic steroid might produce an equivalent net gain of muscular strength following an extended training period. Hence, the anabolic steroid may merely provide a temporal effect by accelerating a normal biological-training effect. Residual effect of an anabolic steroid upon isotonic muscular force. muscular force. Although several studies have specifically directed attention at the effects of anabolic steroids on healthy men, researchers have ignored the possibility of latent behavior of these drugs. The purpose of this study was to investigate the residual effects which may occur following cessation of administration of an anabolic steroid upon muscular force. Ten subjects ranging in age from 21 to 25, volunteered to serve as subjects in this study. Their height averaged 181.5' cm. with a mean weight of 90.40 kg. A double-blind technique was used. The oral anabolic steroid and the placebo were assigned to the subjects by code. The oral anabolic steroid consisted of 15 mg. Methandrostenolone and the placebo consisted of calcium lactate. 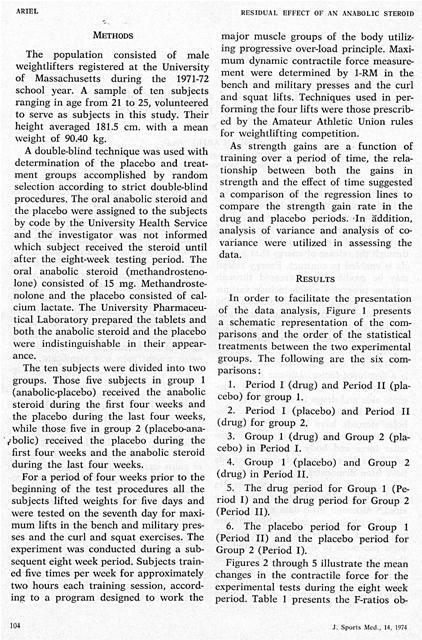 The ten subjects were divided into two groups; anabolic-placebo group, and placebo-anabolic group. Subjects trained five times per week according to a program designed to work the major muscle groups. Maximum dynamic muscular force measurements were determined by l-RM in the bench and military presses and the curl and squat lifts. Those five subjects in group 1 received the anabolic steroid during the first four weeks and the placebo during the last four weeks, while those five in group 2 received the placebo during the first four weeks and the anabolic steroid during the last four weeks. Regression analysis, analysis of variance and analysis of covariance were utilized in assessing the data. indicate that rate of progress and net muscular strength gain may be independent of each other. It may be that prolonged muscular training without an anabolic steroid might produce an equivalent net gain of muscular strength following an extended training period. Effet residuel d'un steroide anabolique sur la force musculaire isotonique. Au cours de ces 10 dernieres annees, une controverse croissante s'est developpde au sujet de l'utilisation par des athletes do steroides anaboliques en vue de produire une augmentation du poids corporel et de la force musculaire. Bien que plusieurs etudes ont attire specialement l'attention sur les effets des steroides anaboliques sur les sujets sains, les chercheurs ont ignore la possibilite d'un comportement latent de ces medicaments. Le but que se propose ce travail est d'examiner les effets residuels, qui peuvent se produire apres l'arret de l'administration d'un steroide anabolique sur la force musculaire. Dix volontaires, ages de 21 a 25 ans, ont servi de sujet pour cette etude. La taille moyenne s'elevait a 181,5 cm. et le poids moyen a 90,40 Kg. La technique du doubleblind a ete utilisee. Le steroide anabolique oral et le placebo ont ete assignes aux sujets par code. Le steroide anabolique oral consistait en 15 mg. de Methandrostenolone et Ie placebo en lactate de calcium. Les dix sujets ont ete divises en deux groupes: lc groupe anabolique-placebo et Ie groupe placebo=anabolique. Les sujets s'entrainaient cinq fois par semaine selon un programme etablr en- vue de faire travailler les groupes musculaires les plus importants. Les mesures de la force musculaire dynamique maximum ont ete dctcrminees par 1-RM dans le developpe et l'arrache, courbe et accroupi, aux (halteres. Les cinq sujets du groupe 1 ont recu le steroide anabolique au cours des quatre premieres semaines et le placebo au tours des quatre dernieres semaines, alors que les cinq du groupe 2 ont recu le placebo au tours de 4 premieres semaines et le steroide anabolique au cours des quatre dernieres semaines. Les donnees ont ete evaluees a 1'aide de 1'analyse de la regression, de la variance et de la covariance. staure clans les organes extra-genitaux. 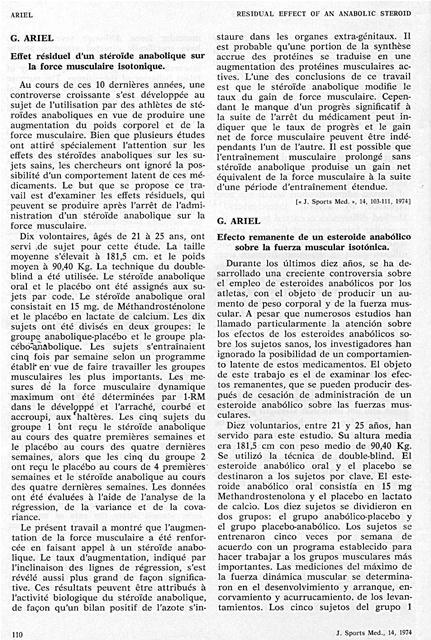 I1 est probable qu'une portion de la synthese accrue des proteines se traduise en une augmentation des proteines musculaires actives. L'une des conclusions de ce travail est que le steroide anabolique modifie le taux du gain de force musculaire. Cependant le manque d'un progres significatif a la suite de 1'arrct du medicament peut indiquer que le taux de progres et le gain net de force musculaire peuvent etre independants Fun de l'autre. 11 est possible que l'entrainement musculaire prolonge sans steroide anabolique produise un gain net equivalent de la force musculaire a la suite d'une periode d'entrainement etendue. Efecto remanente de un esteroide anabolico sobre la fuerza muscular isot6nica. Durante los dltimos diez anos, se ha desarrollado una creciente controversia sobre el empleo de esteroides anabolicos por los atletas, con el objeto de producir un aumento de peso corporal y de la fuerza muscular. A pesar que numerosos estudios han Ilamado particularmente la atencidn sobre los efectos de los esteroides anabolicos sobrc los sujctos sanos, los investigadores han ignorado la posibilidad de un comportamiento latente de estos medicamentos. El objeto de est.- trabajo es el de examinar los efectos remanentes, que se pueden producir despues de cesaci6n de administraci6n de un esteroide anabolico sobre ]as fuerzas musculares. las cuatro primeras semanas y el placebo durante las ultimas cuatro semanas, mientras que los del grupo 2 recibieron el placebo durante las cuatro primeras semanas 2. y el esteroide anabolico durante las ultimas cuatro semanas. Los datos se valuaron por medio de un analisis de ]a regresi6n, de la variaci6n y de la covariacion. de fuerza muscular pueden ser indepen- 10. dientes uno de otro. Es posible que el entrenamiento muscular prolongado sin esteroide anabolico produce una ganancia neta equivalente a la fuerza muscular despues de un periodo de entrenamiento prolongado. [. J. Sports Med. 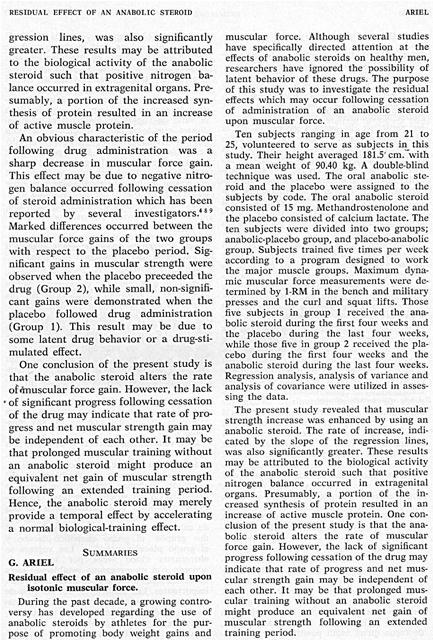 ï¿½, 14,103-111,1974] I.
Ariel G., Saville W.: a Anabolic Steroids: Physiological effects of placebos)). Medicine and Science in Sports, 4, 124-126, 1972. Ariel G., Saville W.: o The effect of anabolic steroids on reflex components ï¿½. 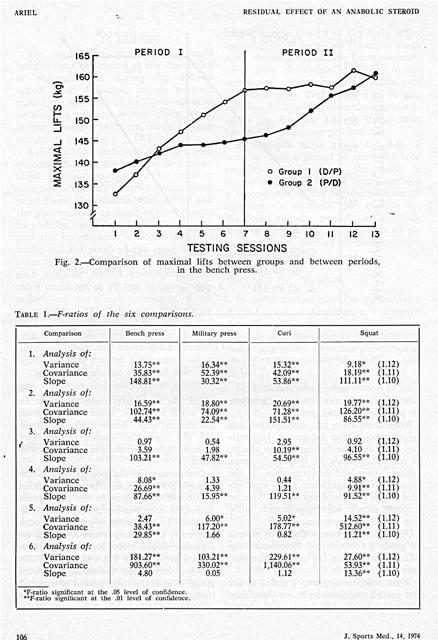 Journal of Applied Physiology, 32, 795-797, 1972. Casner S., Early R., Carlson R.: ï¿½Anabolic steroid effects on body composition in normal young men)). 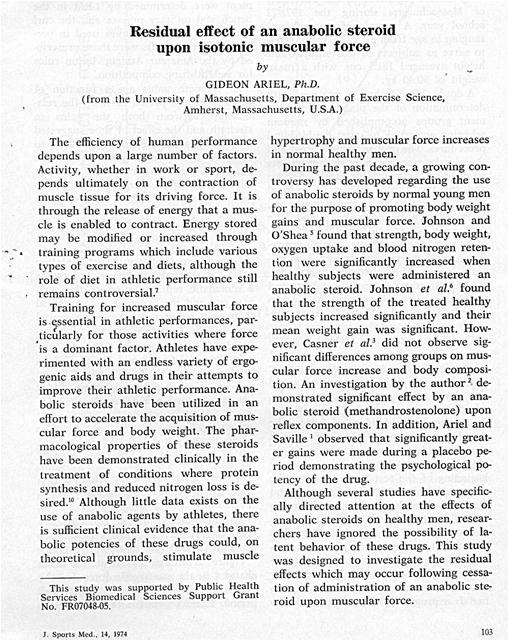 Journal of Sports Medicine and Physical Fitness, 11, 98-103, 1971. 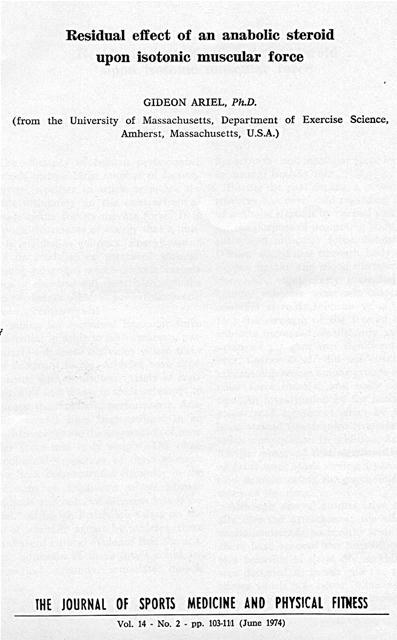 Greene R.: s Androgens and growth a. British Medical Journal, 2, 379-389, 1969. Johnson L., O'Shea J.: ï¿½ Anabolic steroid: Effects on strength development)). Science, 164, 957-959, 1969. Johnson L., Fisher G., Silvester J., Hofheins G.: ï¿½ Anabolic steroid: Effects on strength, body weight, oxygen uptake and spermatogenesis upon mature males)). Medicine and Science in Sports, 4, 43-45, 1972. Keys A.: Physical performance in relation to diet s. Federation of American Societies for Experimental Biology, Federation Proceedings, 2, 164-167, 1943. Kochakian C., Humm H., Bartlett M.: a Effect of steroids on the body weight, temporal muscle and organs of the Guinea Pig)). 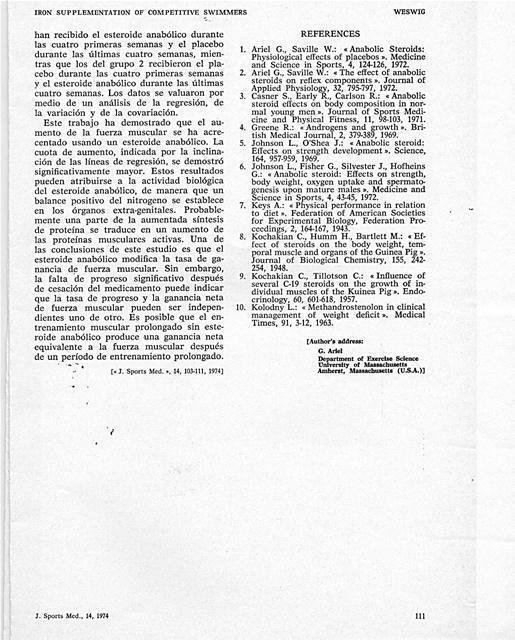 Journal of Biological Chemistry, 155, 242254, 1948. Kochakian C., Tillotson C.: ï¿½ Influence of several C-19 steroids on the growth of individual muscles of the Kuinea Pig;,. Endocrinology, 60, 601-618, 1957. Kolodny L.: s Methandrostenolon in clinical management of weight deficit),. Medical Times, 91, 3-12, 1963. Generated on 4/22/2019 11:15:54 AM (PST) ADI/HQ/GBA/2019/ARIELCLOUD/v3.0.2018.0126.